By Michael O'Leary of Portland, Oregon. Michael is a campaign organizing consultant with the Natural Resources Defense Council. In 2006, he wrote a short series on BlueOregon about his experience as an election observer in El Salvador. The federal pipeline approval process, managed by the State Department (because the pipeline’s cross-border origins) had been on the fast track despite on the record objections from the EPA. Even as far back as October of last year Hillary Clinton herself described the Administration as “inclined” to approve it. President Obama’s rejection of the pipeline proposal Thursday stunned many close observers. Here’s how we did it: We got organized. Less than one week ago on November 6th, myself and 10,000 other protestors encircled the White House in a show of political will. I’ve walked a few picket lines and have never seen a bigger one, or a better organized one. It was tremendous. 4 days later, President Obama issued a formal statement that tabled the project beyond the 2012 elections and is expected to prove so costly in delay that the future of the project is in complete disarray. That’s not just punting. That’s the end of the game. We weren’t alone. It wasn’t just one protest. Congressman Earl Blumenauer and Senator Ron Wyden wrote the White House in objection to the conflict of interest in the permit process. Senator Wyden has also called for the investigation of the evidence of gasoline price-fixing by Big Oil to manipulate the Midwest fuel markets and went on to call the Keystone XL a good deal only for oil producers. Local mayors like Beaverton's Denny Doyle, Corvallis's Julie Manning and Eugene's Kitty Piercy and nearly one hundred other mayors signed their own petition to President Obama asking him to reject the Keystone XL, building on the resolution passed against tar sands oil in the 2008 US Conference of Mayors assembly. Local activist groups like Portland Rising Tide helped organize local protests in conjunction with Occupy Portland. The staff and activist members of traditional environmental organizations, like 350.org, NRDC, NWF, and the Sierra Club directed their phone banks and post cards and leveraged their relationships with Hollywood stars from Julia Louis-Dreyfus and Robert Redford. Perhaps most importantly, concerned land owners all along the proposed route decried the use of eminent domain to condemn private farm and ranch land for use by private oil companies for export without any public benefit – a concern that mirrors that of many Oregonians fighting LNG export pipelines right now. Obama could go back on his word. Another project like the Keystone XL might well come along. The national network of campaigners against the tar sands is maintaining a vigilant watch and will be keeping the pressure on the White House to do the right thing. And there are other fights against big oil. There are other pipelines being reviewed. For anyone engaged in environmental politics, there is no shortage of work to do. 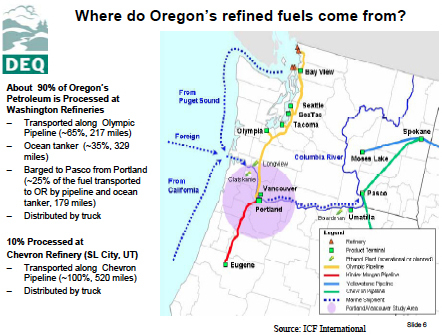 Case in point: According to the most recent DEQ analysis available, with data from 2009, already Oregon is importing over 8% of oil from the tar sands. And while Oregon passed a law relating to implementing Low Carbon Fuel Standards in 2008, the DEQ has yet to publish their Administrative Rules needed to implement the new program, now running almost a full year behind their timeline published only a year ago. With Obama tabling the Keystone XL, big oil is officially on notice that we environmentalists are once again exercising some impressive political power and have some inspirational momentum on our side. I wonder what we’ll do next. Follow the fight against the tar sands & dirty fuel nationally at Tar Sands Action and locally at Tar Free Oregon. @Michael O'Leary: I certainly want to thank you for all your activism around this issue. The prospect of climate change is a problem so serious that humankind has never encountered its like. That being said, I'd feel a lot better about the possibility of this project being dead if Obama were to make a point against it as regards the climate change aspect; what I hear from Obama is concern for Americans' safety, speaking about a possible rupture in the line, which says to me that he might very well okay a re-route. And, let us not forget: the Obama Admin. has greatly expanded coal mining in Wyoming (with an eye to export through PAC NW terminus?) and has expanded offshore oil drilling, including granting rights for deepwater drilling in the Arctic Ocean. So, we'll see what he eventually does with the Keystone XL. With the Republican House in permanent campaign mode, they're fighting every battle they can and making every trade as costly as possible for Dems. DC is no cake walk right now. And it's been very hard to have a sense of assurance about which way Obama would go: what we will or won't trade, and why. Is what we see in his rhetoric a reflection of his policy values or his messaging? We do know that framing environmental concerns as air and water pollution issues tests substantially better among the general public than doing so through the lens of climate action. Obama has done some great things to tackle climate issues head on: improving CAFE standards for cars and light trucks was an amazing move. As was putting smog ratings on the EPA sticker on new cars. And of course, on the very big picture, we're missing out on huge opportunities to do what we should. We don't have a carbon tax. We don't even have a carbon rating on products. What will happen with next years rule update on oil refinery emissions? Time will tell. Certainly we're happy he did the right thing in killing the Keystone XL. Will he ok a new tar sands pipeline in his second term? Certainly that's a risk. As a campaign we're at a complex crossroads, needing to figure out how much we should shift resources to other fights, and how much we need to keep at the ready. Michael is deserving of praise for his efforts. Naomi Klein's evaluation on the economy vs. the environment in The Nation is thorough and informative. Firedog Lake's piece advises that a competing route to Port Arthur is the Flanagan which failed to get FERC approval. It is important to note that British Columbia ports and the St. Lawrence can not handle super tankers. And that is because this filthy mess is intended for export and increased domestic prices. The Saudis own half of the refinery in Texas that will be involved. So efforts to stop this must not abate. One more piece of activism you forgot to mention in an otherwise comprehensive article- 1253 people were arrested in August and September in a civil disobedience action at the White House, including myself and 8 other Oregonians. That action is one of the biggest catalysts in getting the issue into the national press. While the delay is indeed a finger in the dike of the fossil fuel crisis, it is a slow down and a consciousness raiser. Great add to the highlight reel. I wish I would have been able to fly out that week. Big kudos to you and all the others who participated in that action. It was galvanizing. And very well orgagized with lead work from 350.org. I so tried to be comprehensive with the tip of the hat far and wide. My apologies. I guess I also failed to mention amazing media coverage from the New York Times, Mother Jones and Huffington Post, the Eugene Weekly and others. I should also highlight our Canadian side allies, many of them working for years and years on the tar sands in relative obscurity: Greenpeace, the Dene Nation, the Pembina Institute, David Suzuki, and Andrew Nikiforuk and many more. And I think I should also have called out the relating campaign against the heavy haul of the megaloads of tar sands refinery equipment through Idaho and Montana. All Against the Haul, Rick Bass & David James Duncan, Advocates foe the West, the Nez Perce Nation, and so many more on the highlight reel. Anyone with more adds for the shout outs? This is a important win and everyone who was a part of this earns their kudos. Thanks again to Barbara and the other direct action participants! Congratulations! Environmentalists destroying opportunity and taking bows. Love it! Huh. Somehow you missed the memo from the London School of Economics that, left unchecked, climate change will destroy 5-20% of the world's GDP. Or the Sunday story about Sherman County in Oregon explaining they vaulted from last in per capita income in the state in 2004 to second (that is, from #36 to #2) thanks to wind development. No; he wants that to happen. Then all his fascist buds can declare martial law and kick our liberal asses legally. This is what the left do not get about the right. Many of the teabaggers DO NOT love banksters and big corps. They hate us with every fiber of their being and don't care who that ends up benefiting. If they could see the outcome...they would change nothing. They'd rather poison their own children than let us have a point on any issue. For my money, they're terrorists pure and simple. I kind of like the Bush Doctrine on terrorism. When are we going to start applying it to the likes of these SFBs? "That’s not just punting. That’s the end of the game." That's a pretty confident and definitive statement. I'd be curious to hear a little more why you think this is the case. Also, I've heard an argument that this pipeline is basically about exporting crude out of the U.S. which would open up the tar sands more broadly to exploitation, but that even without the keystone, the U.S. and Canada can still go after it pretty aggressively. In that light, how significant is stopping the keystone XL? I'd like to see the Keystone XL project shutdown, but characterizing Obama's decision to reexamine the route through Nebraska as the death of the project is like announcing a football win because you're leading a single touchdown at the end of the third quarter. The questions about jobs, the environment, debt and national security are all involved here. More than one hundred thousand people have sent letters to President Obama requesting one simple thing. That is, to require all new vehicles purchased by the U S Government to operate on natural gas. This would be a significant push on the demand curve beginning a conversion of the auto industry; jobs created by establishing additional infrastructure; reducing capital outflow to purchase foreign oil; influencing geo-political decisions on dominence of the middle east. Natural gas is being burned by the billions of cubic feet to create the oil slurry. What a waste. This is a vital transition fuel. Oregon's Coos Bay is preparing to export natural gas. This is a huge error as it maintains too many status quo factors. If killing this pipeline project will prevent ground and water pollution in the USA, it deserved to be killed. However I think it may be a bit naive to believe that killing the US pipeline will prevent the Canadian oil from getting to world markets. Kinder Morgan owns and operates an oil terminal in BC and is in the process of permitting a pipeline from Alberta to BC as well as expansion of the existing oil export facility. Although our Canadian neighbors share some environmental goals with us, they have to date proven to be at least as interested in supporting their energy export infrastructure as they have been in supporting environmental causes. Part of the enthusiasm is framed from the perspective of what's possible, from a skeptic's perspective. For example, if President Obama today said he'd never let a new pipeline happen in my lifetime, or in '17, or in '13 even, I'd have to say, that's too far down the road to promise. By '17 we will have a new President. By '13 we might. If he says none through '12, well, that's actually the best he can promise. The actual cost of trying to ramp up a project the scale of the KeystoneXL is expensive. TransCadana is on record suggesting these costs are at $1,000,000 per day. These delays not only represent a shortfall in projections, but make for breach of contract, undoing the basis for investor support as they seek more stable and productive investments, whether that be in Alaska, the Gulf, in smart car technology, or whathaveyou. Either way, investors who have been told to trust Obama would green light the pipeline are about to lose their bets on their quarterly earnings in a big way. 2.A. The proposed route that's been nixed, compared to other potential/hypothetical routes, actually crossed fewer waterways and went through fewer populated areas. It would have been a crime against mother nature to put a tarsands pipeline though the Ogallala aquifer in Nebraska. Putting it though hundreds of other rivers is not better for the planet, and gives us more to organize with and sue over in more communities. 2.B. Every day that car and light truck mileage improves, and every day our telecommute & cloud based business economy grows, and every day the active/public/smart-trip transportation options become increasingly engaged by newer generations that are more environmentally and health conscious,our oil dependence per person and per mile is decreasing. Sightline just this year crunched the numbers to show that here in the norhtwest, despite population growth, and depsite long commutes and long trips being normal for many, we're using no more gasoline than in 1999. Peak consumption is here before peak oil. http://bit.ly/sfZ3wR The reduction in demand is huge for us. Not only did we make huge headway in growing a broad understanding, of the issue, we began with a dynamic, robust and open source campaign where an exciting style of activism has been rewarded with an exciting win. By going from, if you'll excuse the auto metaphor, 0-60 in record time, we've got a lot of great momentum. If need be, it will be much easier to pick up where we left off, than it was to start from a dead stop. So, yeah, we feel like it's a win. And if big oil isn't yet ready to admit it, we feel pretty positive about going for a rematch. Erik, great question on the supply issues. As I noted, we're not increasing our domestic use of gasoline. Nor are the tarsands cheap to produce oil from. It takes a lot of energy to bake carbon out of the sand and refine it into something you'd want to use in today's auto engines. It's a lot costlier than with conventional oil drilling. And as a commodity, fuel has a very restricted delivery chain. Currently the US is underusing the exiting Canadian tarsands supply pipeline capacity by about 50%. Altogether this under-supply of Canadian tarsands currently is a function of tarsands cost, the competition of other supply sources, the scarcity of refinery and shipping options. If the KeystoneXL was built, the access to Gulf refining and shipping was bound to produce increased exports. By bottling up our Canadian supply where it is, stuck in the midwest, local consumers are saving about $.25/gallon because they can't drain the supply overseas, and production is limited, thereby limiting the environmental impacts overall at the same time. It is a very market-unique convergence of pocket-book benefit and environmental value. Larry, if your point is that we have a lot yet to do in terms of realigning our daily lives and our economy to be sustainable, I concur. But this is one giant project that's just not getting built. It's a huge win. It keeps beg oil from putting dirtier oil in our gas tanks. It protects critical habitat in both Canada and America. And it is in solidarity with the First Nations to our north that are impassioned and mobilized in the fight to save what is left of their home lands from the pollution of the tarsands industry. I'll say it: Scoreboard, baby. We've got a pretty good pipeline map, actually. I for one am pretty impressed that the BC province and the First Nations in Canada have done a fine job of bottling up the proposed Enbridge tar sands pipeline from flowing to the Pacific ocean. And I'm hopeful that Oregon's, along with California's Low Carbon Fuel Standards will help the existing market forces from encouraging further displacement of Canadian crude with tar sands. And I'm excited to see what the EPA's new refinery rules will mean for limiting tar sands supplies in to our region's refineries in northern Washington state. My good friend Trip Jennings, a National Geographic Explorer and documentary film maker has done great work on the subject of the proposed Enbridge tarsands pipeline threatening the northwest. It just won the Environmental Documentary Award at the Banff Film Festival. We screened it at the Hollywood earlier this year and I look forward to another showing. But that's just not the kind of approach to the world's problems that appeals to me. We recycle. We buy local. It doesn't mean we don't care about other markets or communities. It just means that we do what we can.